﻿ Q305: How do I setup my Stripe account to accept payments for the reservations through SOFORT? FAQ Q305: How do I setup my Stripe account to accept payments for the reservations through SOFORT? First of all, to accept SOFORT payments through your Stripe account, you need to activate the SOFORT payment method in your Stripe Dashboard. You can do this in the Payments / Settings section. For test transactions, you should enter the test API secret and publishable key. Note that the test credentials start with sk_test_.... and pk_test_.... Please make sure to change the credentials back to production values when want to start receiving real payments. In order for our system to be notified about payment events and updates that happen in your Stripe account, you need to add a webhook that will point to a script in our system. This way we know when a SOFORT payment is actually authorized by the customer and can be charged. Thanks to the webhook events we will also know when the charge is completed and can be finally registered in the corresponding reservation. When you click Add endpoint, a pop-up window appears where you can enter the webhook settings. In the Filter event section, select the six event types that should be sent for the webhook: charge.succeeded, charge.failed, charge.refunded, source.chargeable, source.failed and source.canceled. Once you click the Add endpoint button to submit the settings, the Signing secret section appears below Webhook details (see the picture below). In the section, click the Click to reveal button to see the webhook secret. 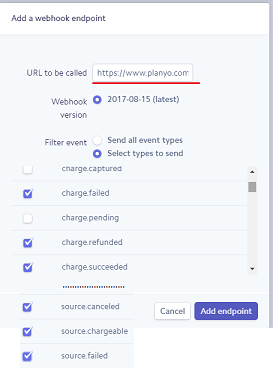 Copy the value and enter it in your Planyo Online payments page as instructed above (webhook secret is the third value there). The webhook secret is necessary for authenticating events coming from Stripe to our system. 1. Please note that Stripe SOFORT works only in Austria, Belgium, Germany, Italy, Netherlands and Spain. When initializing a SOFORT payment in Stripe, we use the country value selected by the customer on the reservation form. The value is used as the customer's bank country in Sofort. You need to make sure that the country field is required in your reservation form setup in Planyo and is actually specified by the customer. As mentioned, Stripe SOFORT will be available for payments only when the customer chooses one of the listed countries. 2. In order to pay with SOFORT, customers are redirected to SOFORT's site where they enter their bank login credentials. Upon authentication, SOFORT initiates a bank credit transfer from their bank account. Until the funds are actually received in your business bank account, the transaction's status in Planyo is 'pending'. It typically takes SOFORT 2 business days (but can be up to 14 days later) to actually transfer the funds. Once this is done, the status in Planyo is automatically changed to 'paid'.